The United States welcomes more children through international adoption than any other country in the world.1 If you’re considering adopting a child from another country, here’s a guide to foreign adoption costs. A recommended first step once you’ve decided to pursue an international adoption is to find a qualified adoption service provider. Paperwork requirements can be significantly different between countries, so it’s wise to work with experts who understand the policies and procedures you’ll need to follow. Plus, your adoption agency can help you better understand the expenses you might undertake with an international adoption. Be sure to request a written list of the total fees and estimated expenses. Also ask if there are additional fees which would not be covered by the adoption agency. 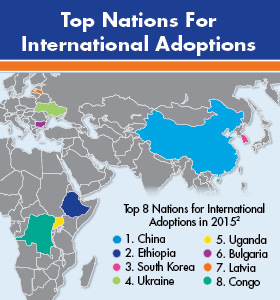 How much will an international adoption cost? To make matters more complicated, costs can also be impacted by the individual circumstances of the child you’re interested in adopting. Many countries, for instance, may reduce adoption fees if you adopt an older child or one with special needs. There’s no doubt that adopting a child from a foreign country can come with significant costs. But you may have help on that front. Because adoption benefits are offered by many companies, your Human Resources department may be able to show you employee benefits that could help you take care of some of the fees. Your accountant could also check if you’d qualify for a tax credit when the adoption becomes final. If you’re still looking for additional funds to cover the costs of an international adoption, you could consider taking a look at a personal loan. A personal loan from Discover of up to $35,000 can help you bridge the gap between your savings and projected adoption costs. Plus, fixed rates and repayment timelines can help you confidently budget your payments, so you can focus on a new member of your family.